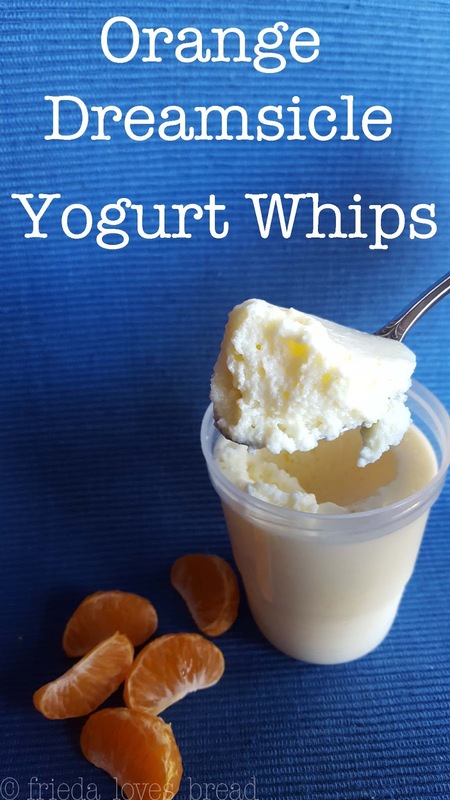 This is our newest favorite yogurt - Orange Dreamsicle Whips! 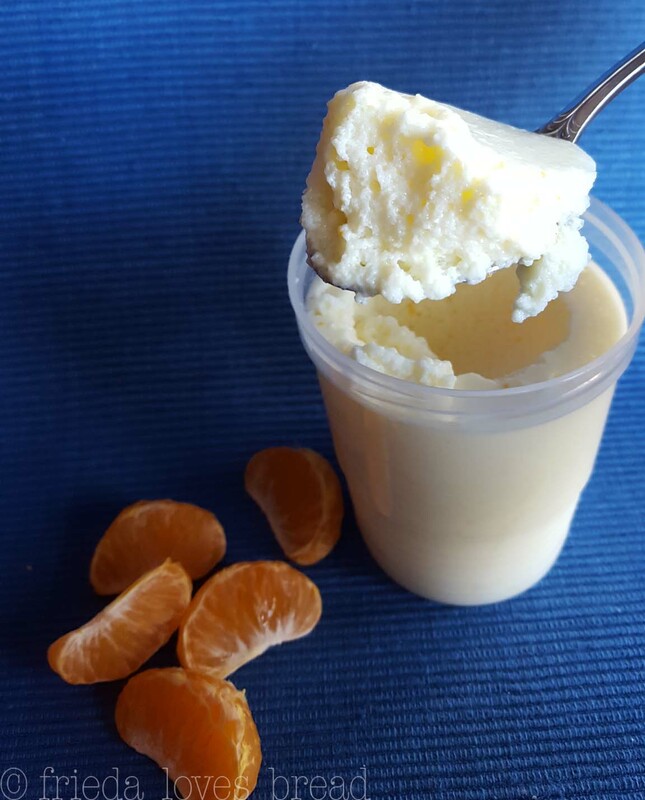 A light, airy, mousse-like texture yogurt with the sweetness of orange - reminds me of the Orange Creamsicle bars that taste so good in the summertime! This easy pressure cooker (and stove top) Orange Curd was the inspiration for this oh-so-yummy treat. You can even substitute the orange juice for lemon juice or lime juice. You can use bottled juice, if you wish. This recipe uses a no-strain yogurt, so you keep all the great benefits of whey: loads of calcium and B vitamins. You use four cups of milk, but can get up to 7 cups of yogurt when it is whipped, as it can almost double in volume! 1. 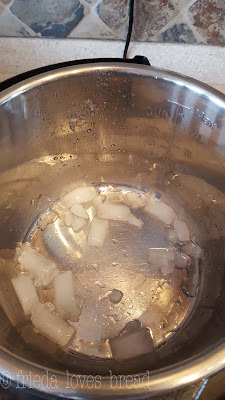 Put some ice cubes in your Instant Pot, if using as your yogurt maker. This keeps the milk from sticking to your pot. 2. Put 1 1/2 teaspoons of freshly opened plain yogurt (with live/active cultures) into a small dish or cup to bring to room temperature. 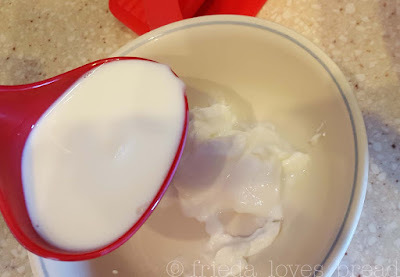 Bringing it to room temp will help dissolve the yogurt more easily. Set it aside. 3. Mix 1/3 cup of instant milk powder into 3 1/2 cups milk. 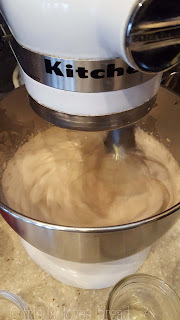 Using an immersion blender will ensure there are no lumps. Instant milk powder dissolves much better and easier than dry milk powder, which mixes better with hot milk and using a blender or immersion blender to prevent clumping. If all you can find is dry milk powder, add it after your milk has heated. Put this mixture into the Instant Pot liner. Cover, set pressure valve to sealing. Push Yogurt, then quickly push Adjust. The display will say BOIL. 4. 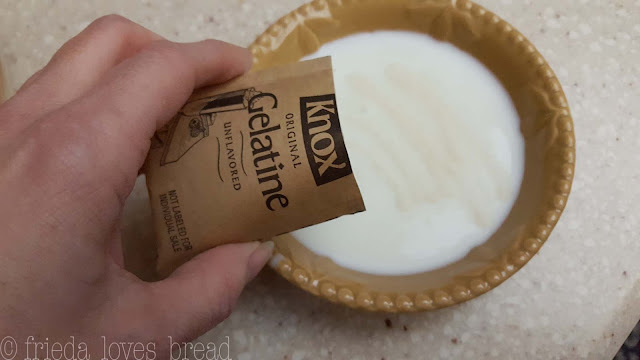 While your milk is heating, take the reserved 1/2 cup of milk and sprinkle your 1 tablespoon (one pkg of Knox) of unflavored gelatin and let it sit. This is called "blooming" or softening the gelatin. 5. 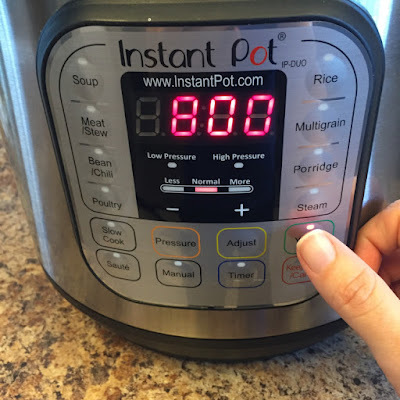 At the end of the boil cycle, the Instant Pot will beep. Take the temperature with an accurate thermometer. It should easily read 180°F or higher. If it is not that hot, no worries! If using dry milk powder (instead of instant), add it at this time. 6. Remove any skin that may have formed on top of the milk during the heating process. 7. Whisk your bloomed gelatin in the hot milk. The heat will help dissolve the gelatin. 8. 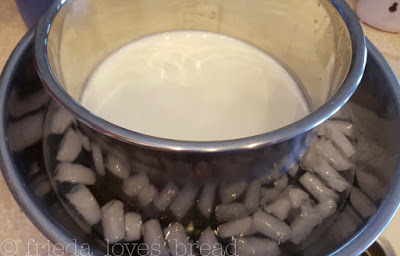 Cool your milk to 100° - 110°F by setting the pot in a bowl of ice water or sink with cold water. Whisk while taking the temp - it will only take 2-3 min, which is FAST! 9. When your milk has cooled, take a cup of cooled milk and pour it over your yogurt starter. Whisk it smooth. Pour the mixture back into your cooled milk and whisk well. 10. Dry off the outside of the Instant Pot liner and put into the Instant Pot. You can set the timer to incubate as little as 4-5 hours for a very mild yogurt, or as long as 8-10 hours for more tang. Use the +/- buttons to increase/decrease the time. 11. At the end of the yogurt cycle, take the pot liner of yogurt, cover and put into the fridge for 8 hours or overnight. In the morning, for a "whipped" yogurt, use a hand or stand mixer or put the yogurt with whisk attachment and start on a low setting. Gradually increase to the highest setting and let it whip for at least 10 minutes, till the yogurt has almost doubled. You can skip this step if you want a creamy yogurt, instead of a whipped yogurt. 12. Gently fold in the Orange Curd, a large scoopful at a time, till it is completely mixed in. You can use a hand held whisk or a spatula. Pour the yogurt into your desired serving containers. It will look thin and bubbly, but will set up beautifully in the fridge, when chilled in 4-6 hours. The secret to making these light-as-air, melt in your mouth, whipped yogurt is unflavored gelatin. Gelatin must be softened in cold milk, then dissolved in hot milk to set properly. Whipping the finished yogurt will look thin and bubbly, but will set after a few hours in the fridge. 1. Put several ice cubes in your Instant Pot liner. Wait a few minutes to melt, then dump out the ice/water. Do not wipe the pot dry.2. Take out 1/2 cup of milk from the 4 cups of milk. Set aside. This is for your gelatin.3. Add the instant milk powder to the 3 1/2 cups of remaining milk and mix till smooth. Pour milk mixture into the chilled IP liner.4. Cover IP, close pressure valve, select Yogurt Boil setting.5. While the milk is heating, sprinkle 1 Tablespoon gelatin over the 1/2 cup reserved milk. Let it sit to soften, or "bloom".6. 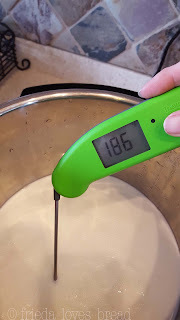 At the end of boil cycle, test the temp of the milk. It should be 180°F or higher. Remove the milk skin on top, if any.7. Stir the softened gelatin and whisk it into the hot milk. 8. Cool the yogurt to 100°-110°F at room temp or over an ice water bath, whisking while taking the temp. With cold water, it should only take 2-3 minutes to cool. 9. Take a cupful of cooled milk and pour it over your yogurt starter. Whisk till smooth; whisk tempered starter back into cooled milk. 10. Cover the Instant Pot, close pressure valve, and select Yogurt Normal setting. You can push the (+/-) buttons to increase or decrease the incubation time. 4-5 hours for a mild yogurt, 8-10 for more tang.11. When yogurt cycle ends, put the pot of yogurt, covered, into the fridge, for at least 8 hours or over night.12. 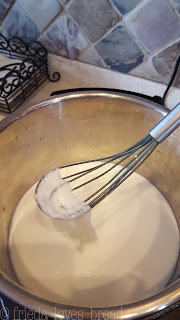 Once yogurt has chilled, stir the Orange Curd** into the yogurt, put into storage containers to re-chill in the fridge, OR for a Whipped Yogurt, whisk your yogurt with a stand mixer and whisk attachment for at least 10 minutes, or until yogurt has almost doubled in volume. Fold or whisk in the Orange Curd in large spoonfuls with a spatula or gently by hand with a handheld whisk. The yogurt will look thin and bubbly. Pour into serving containers, cover, place in the fridge for another 4-6 hours or longer to re-set the gelatin. **Experiment with other citrus curds, or by adding powdered Jello pudding flavors for a variety of whipped yogurt flavors!